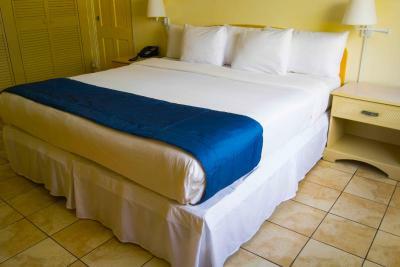 Lock in a great price for Siesta Hotel – rated 8.3 by recent guests! Excellent location. 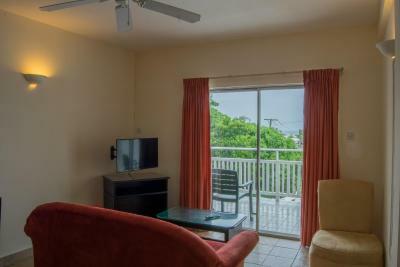 In a very quiet area, right by the beach, and close to lots of restaurants. Very clean and comfortable. Walking distance to beach, small mall and restaurants. 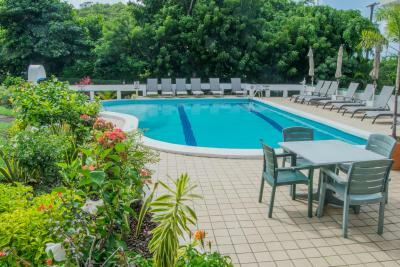 The location is better than we expected, close to the Spice Island mall, restaurants, and both Grand Anse and Gros Morne beaches. 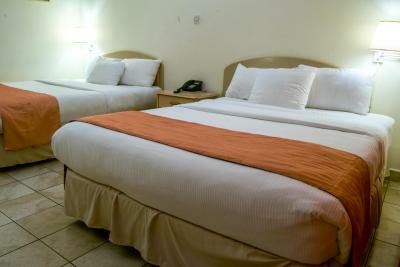 The room was basic but very comfortable, especially the large double bed. The restaurant was unfortunately not open the days we were there (Sunday to Tuesday) but looks like it has a good menu featuring local dishes. I wish I could comment on the coffee, but none was provided. The pool is really nice and the gardens are lovely. Breakfast had great food and great cappuccino! Friendly and prompt service. the ambience, the friendliness. it's a very clean hotel. great for weekend getaways. Attentiveness from the staff. Owners we really friendly and went out with us to help get temporary driving license and local sim card. I like the location because the beach and shopping center was right there. 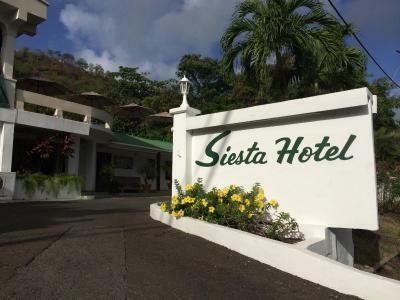 Siesta Hotel This rating is a reflection of how the property compares to the industry standard when it comes to price, facilities and services available. It's based on a self-evaluation by the property. Use this rating to help choose your stay! 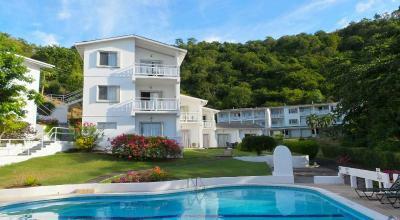 Siesta Hotel is located 5 minutes’ walk from Grand Anse Beach, in southern Grenada. 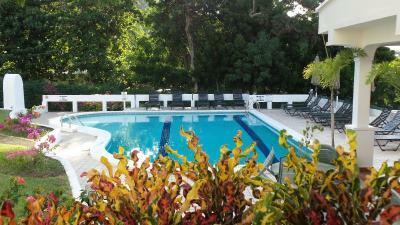 It offers an outdoor pool and air-conditioned rooms with free Wi-Fi and satellite TV. 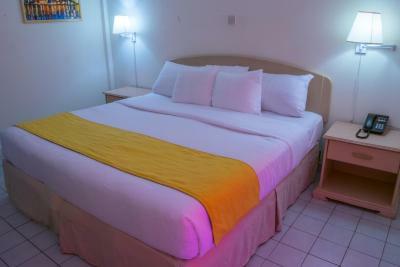 Siesta Hotel has rooms and apartments, all with tiled floors and simple décor. 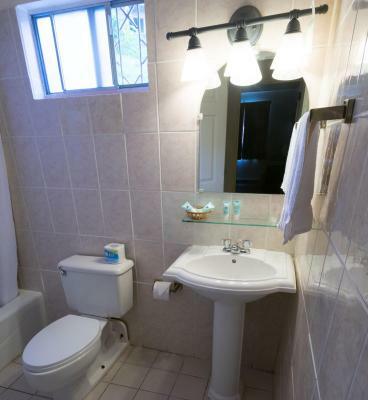 Each one has a private bathroom and views of the garden. Some also have views of the sea. 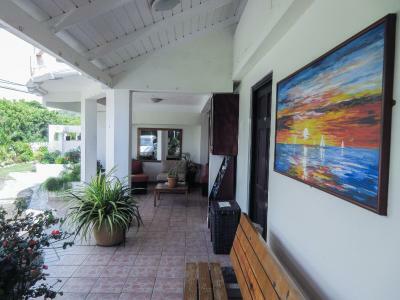 The hotel’s La Deliciosa Restaurant serves Creole and international food. 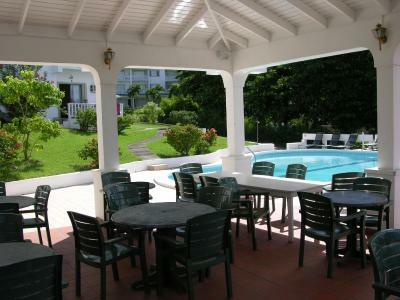 There is a covered terrace next to the pool where you can enjoy your meal or a drink. 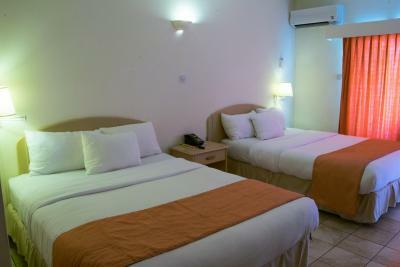 There is a variety of restaurants and shops located 5 minutes’ walk from the hotel. 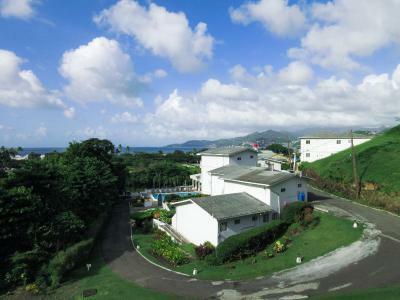 You can drive to St Georges in 15 minutes, and Port Salines Airport is 10 minutes away. 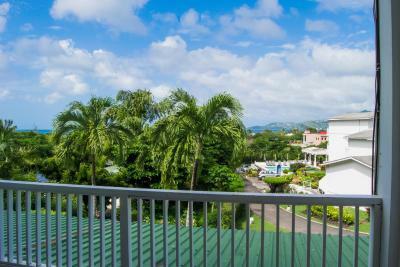 This property also has one of the top-rated locations in Morne Rouge! Guests are happier about it compared to other properties in the area. 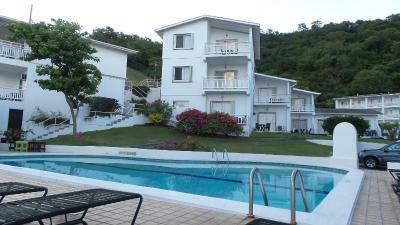 This property is also rated for the best value in Morne Rouge! Guests are getting more for their money when compared to other properties in this city. 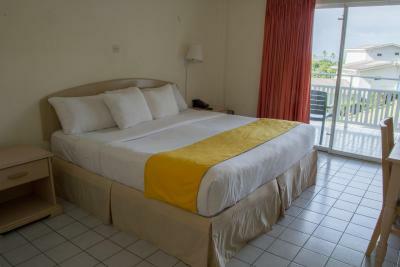 When would you like to stay at Siesta Hotel? 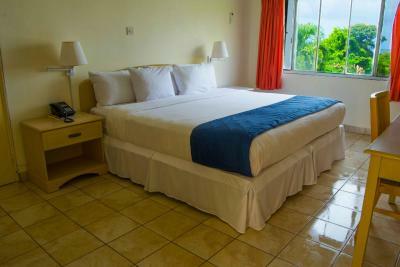 This room is air-conditioned and comes with free WiFi, a fridge, satellite TV and a private bathroom. 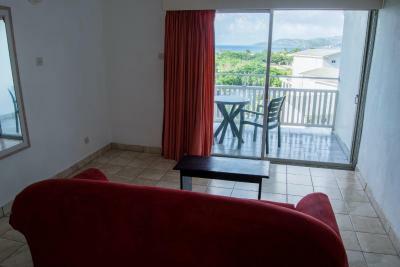 Located on the upper floors, this air-conditioned apartment offers ocean views. 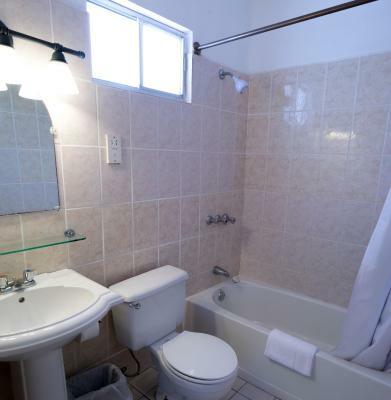 It comes with free Wi-Fi and a lounge with satellite TV. 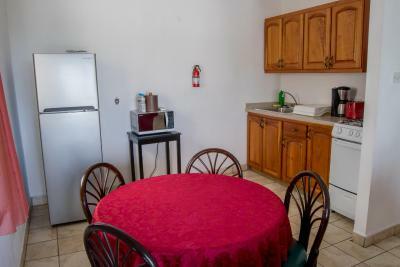 The kitchenette includes an oven, fridge and a coffee maker. House Rules Siesta Hotel takes special requests – add in the next step! 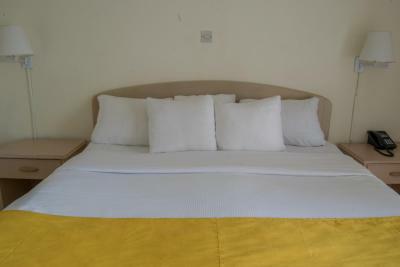 Up to three children under 12 years are charged USD 30 per night when using existing beds. Siesta Hotel accepts these cards and reserves the right to temporarily hold an amount prior to arrival. The entire experience was great . I have no complaints . Restaurant was closed Monday and Tuesday. Pool ladders need to be fixed. 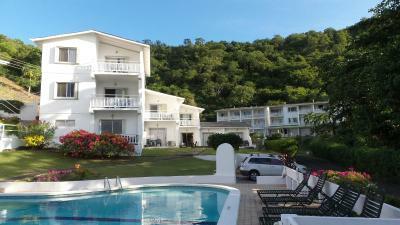 Location was excellent being close to Grand Anse beach, shopping centre and great restaurants. Also close to bus stop to get a local bus. 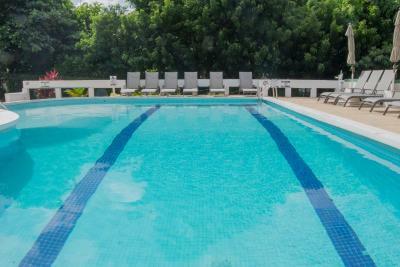 Great pool spacious apartment and great onsite restaurant. Kitchen utensils and cutlery still rather sparse. No potatoe peeler or kitchen scissors as an example. Just one large coffee mug. Living room chair badly stained with a leg falling off when moved. Minor items that need attention. What a difference a year makes. 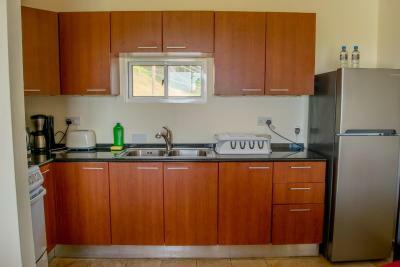 All new kitchen cupboards, counter top and appliances. Plugs in bath and washbasin that are new and work so one can have a bath. 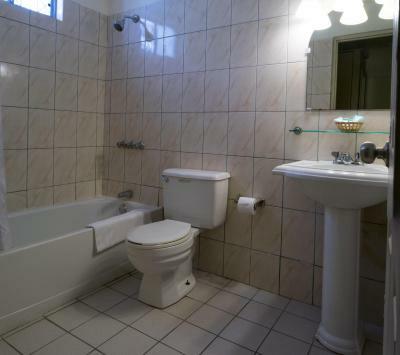 No damaged tiles in bathroom and new wash hand basin. lovely landscaped gardens with good variety of flowering plants. The gardener obviously takes considerable pride in looking after what he was planting a year ago. 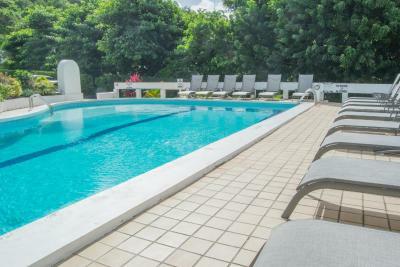 Swimming pool is very clean and lounge chairs around the pool all new to a modern and comfortable design. When we first arrived it was dark and we couldn't really see where to go as it is set back a street from most things. The security man gave us a lift to the nearest bar to get some food and then we found our own way back. 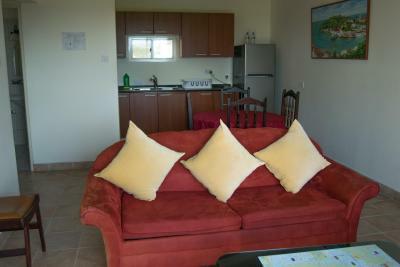 Large room with good kitchen and balcony with sea view. Nice pool to ourselves. Almost incredibly, there is no breakfast or lunch available on a Monday or Tuesday, and we were there on a Monday. (And no evening meal on any day.) In all my years of travelling around the world I have never previously been in a hotel that did not provide breakfast. Furthermore, there was tea-making equipment in the room, but no tea, coffee, milk or sugar. We had teabags of our own, but when I asked Reception for milk and sugar the young man refused point-blank. Not friendly. 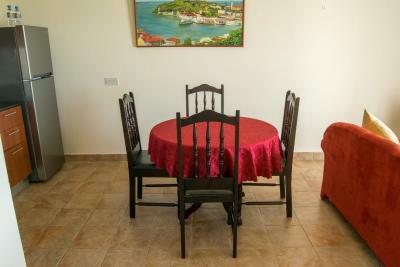 This is a basic functional hotel for holidaymakers who are clearly expected to buy their own provisions from a supermarket ten minutes down the road. 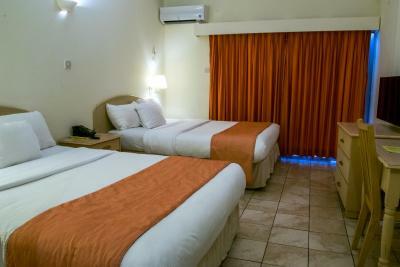 Large, comfortable room and good bathroom. Quiet location. 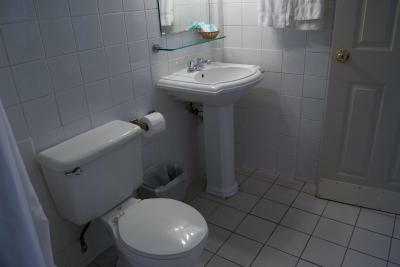 The interior is already quite old and could be renovated, especially in the bathroom, but everything is very clean. Another point is that you here your neighbours when talking or listening to music, so everyone should be respectful and take care of each other, then it's fine. 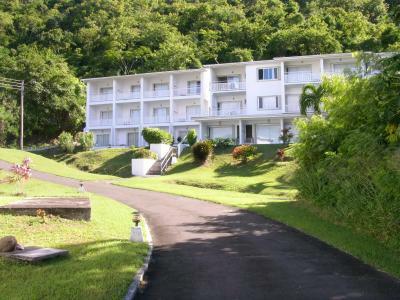 The place is very close to one of the nicest beaches, so you can walk to many sights and to a supermarket judt 300m away. 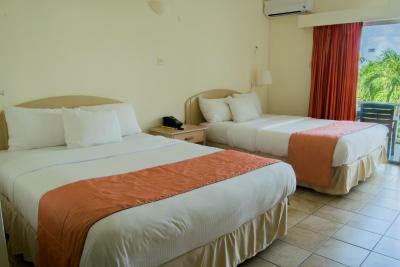 The rooms are very big and the bed is quite comfortable, there is a microwave, a fridge and little kitchen equipment. It was a little sketchy to walk to at night since it’s in an isolated area. But I had no issues, just be vigilant! Aged, limited linens- no washcloths. Bed was made but no other cleaning. There was a coffee maker but we had to ask for filters and there weren't any of the right kind. We had our own coffee, but sugar packets and milk would have been nice. There was a good sized fridge. Add a hot plate, and you'd have a kitchenette! Which we would have liked. 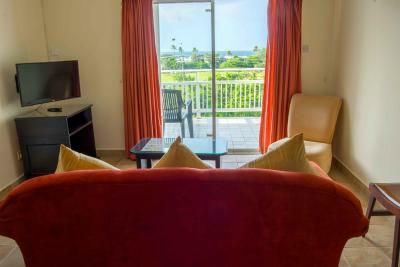 If we were asked to be “picky” then aspects of the room were becoming a little tired But didn’t affect our stay at all. The grounds were colourful and beautifully manicured. 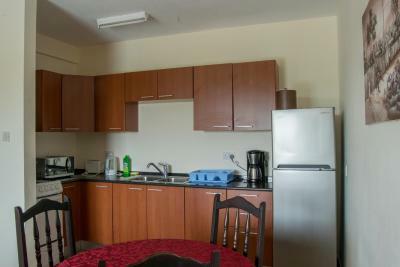 Kettle, microwave and full size fridge (and we were not staying in a larger apartment.